Bandai’s official Youtube Channel was just recently updated with a new video previewing the DX Marron Energy Lock Seed that was just revealed. Just like when the DX Proto-Sukia Seed came out, Zack’s actor Gaku Matsuda appears in character for the promotion. As he is reciting lines from the upcoming V cinema, the video might contain potential spoilers. Pre orders for the DX Marron Energy Lock Seed will end August 27, 2015 with a shipping Date of sometime in November. The set retails for 2,700 yen before shipping/middleman fees, and will include a Genesis Core unit. Bandai Premium has opened two pages for special new LockSeeds- made in honor of the upcoming second Kamen Rider Gaim: Gaiden video special! 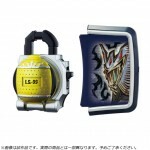 The first set will feature DX LockSeed #99– the Lemon LockSeed! 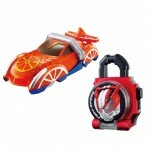 This new addition is used by Kamen Rider Duke in his Armored Rider form, and includes a special faceplate for the Sengoku Driver based on Duke’s new design. This set is bundled with the Gaiden DVD release and will cost 7560 Yen. 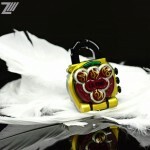 The second set contains Energy Lock Seed #06– the Chestnut Energy LockSeed! 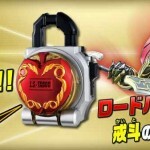 This updated Energy Lock will be used by Kamen Rider Knuckle and comes with a Genesis Core attachment that will allow the Energy Seed to be used with the Sengoku Driver. This set is priced at a mere 2700 Yen. Both sets are scheduled for release alongside Gaim Gaiden 2 in November 2015! Going along with the Gaim Gaiden V Cinema story info that just dropped earlier tonight, Bandai updated new release info for the DX Taboo Lock Seed and Face Plate set! The pair appears to be bundled with the Gaim Gaiden BluRay and DVD Combo Pack that will be coming out April 2015. No price was given, but unfortunately Japanese BluRays tend to be expensive, so this set might be too pricy for some. 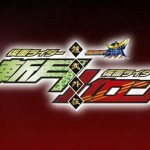 Some time ago we reported on the possibility of a follow-up Kamen Rider Gaim production featuring Kamen Rider Baron and Kamen Rider Zangetsu. Now, Toei’s official Youtube channel has put up a short preview! Tentatively referred to as Gaim Gaiden, this new adventure will see Kaito & Takatora clash over a previously-unknown power source: the Taboo LockSeed. Speaking of the DX Taboo Lock Seed is also being produced in conjunction with this film! This special feature will be released on Blu-ray and DVD on April 22! With Movie War Full Throttle expected to launch in Japan this weekend, k2eizo of youtube comes through with another video review, this time taking a look at the DX Shift Fruit Car and Drive Lock Seed set! 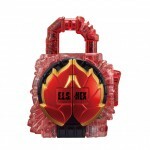 The first of the Premium Bandai items from Kamen Rider Drive X Kamen Rider Gaim Movie War Full Throttle’s just opened up for pre order: and it’s the E.L.S HEX Lock Seed of Kamen Rider Duke. What’s more, the good doctor’s actor Tsunenori Aoki appears in character as Professor Ryoma Sengoku himself to promote this item, continuing the trend from previous Premium Bandai Gaim releases. The DX HEX Lock Seed will be released January 5th retailing for the reasonable price of 2,160 yen before shipping and middleman fees are factored in. One last hurrah for Kamen Rider Gaim collectors! 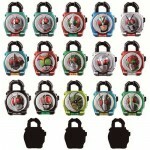 Bandai Premium has opened a page for a special set of LockSeeds featuring the Showa-Era Kamen Riders! In addition to the 15 Showa Riders (everyone from Kamen Rider 1 to Kamen Rider ZO), the set also teases three more Secret LockSeeds with unidentified properties. Orders will open September 18 and release is scheduled for January 2015. The price is a somewhat steep 14,580 Yen before shipping and fees. 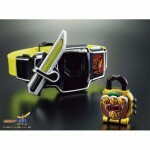 DX YomotsuHeguri LockSeed Orders Open, Video Demo Online! 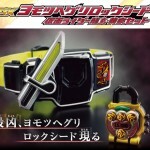 Bandai Premium has opened a new page for one last DX LockSeed & Sengoku faceplate set, featuring YomotsuHeguri Lock– the strange new power granted to Kamen Rider Ryugen. The DX YomotsuHeguri Set will be released in December 2014 and costs a mere 2160 Yen before shipping and fees.